Alfred's Basic Adult All-in-One Course is a greatly expanded version of Alfred's Basic Adult Piano Course that includes lesson, theory, technic and additional repertoire in a convenient, "all-in-one" format. This comprehensive course adds such features as isometric hand exercises, finger strengthening drills, and written assignments that reinforce each lesson's concepts. 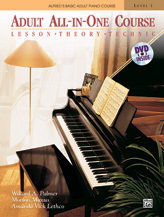 The accompanying DVD includes introductions to the lesson material in the book and performances of most of the pieces by well-known teacher, Gayle Kowalchyk. Book titles include: Alouette * Alpine Melody * Amazing Grace * Au Claire de la Lune * Aunt Rhody * Auld Lang Syne * Aura Lee * The Bandleader * Beautiful Brown Eyes * Blow the Man Down! * Blues for Wynton Marsalis * Brother John * Cafe Vienna * The Can-Can * Chasing the Blues Away * Chiapanecas * Cockles and Mussels * The Cuckoo * Day is Done * Dueling Harmonics * The Entertainer * A Friend Like You * Go Down, Moses * Good King Wenceslas * Good Morning to You! * Good People * Got Those Blues * Greensleeves * Happy Birthday to You! * Harmonica Rock * Harp Song * Here's a Happy Song! * He's Got the Whole World in His Hands * I'm Gonna Lay My Burden Down * Jericho * Jingle Bells * Joy to the World! * Kum-ba-yah! * Largo (Dvorak) * Lavender's Blue * Lightly Row * Little Brown Jug * Liza Jane * London Bridge * Lone Star Waltz * Love Somebody * Lullaby * The Marine's Hymn * Mary Ann * Merrily We Roll Along * Mexican Hat Dance * Michael, Row the Boat Ashore * Money Can't Buy Everything * My Fifth * Ode to Joy * On Top of Old Smoky * O Sole Mio * Raisins and Almonds * Rock Along * Rockets * Rockin' Intervals * Rock It Away! * Scarborough Fair * Shoo, Fly, Shoo! * Skip to My Lou! * Standing in the Need of Prayer * The Stranger * Tisket, a Tasket * Waltzing Chords * Waltz Time * What Can I Share * When the Saints Go Marching In * Why Am I Blue?